The Bunny Jackpot Tug is a great toy to start your dog tugging, or for dogs that like that extra bit of 'tastiness'. 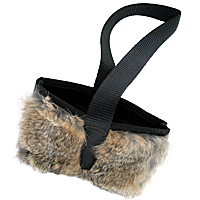 The nylon treat pouch is covered with real rabbit fur on one side and is secured closed by Velcro. Stuff with food, squeakers or whatever your dog likes. Note that this toy is not designed for dogs that heavily tug or rip at toys as the rabbit fur may detach from the pouch. The pouch is approx 11cm high and 15cm long. The handle is approx 20cm. It is not recommended that this toy be washed as the scent may be removed. Pouch can be cleaned by wiping inside section.